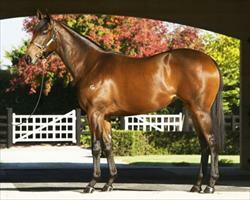 Black Caviar’s younger half-sister is joining the Victorian stable of Danny O’Brien. BC3 Thoroughbreds and Caulfield Cup-winning trainer Danny O'Brien combined to secure Black Caviar's half-sister at today's Inglis Easter Yearling Sale in Sydney. BC3's Bill Vlahos bid to $2.6 million for the daughter of supersire Redoute's Choice and Black Caviar's dam, Helsinge, to land the headline act of this year's sale. The half-sibling to not only Black Caviar but also the unbeaten All Too Hard, who is favourite for Saturday's Group 1 ATC Sires' Produce Stakes, and three-time winner Moshe will be trained O'Brien, who has a relationship with Vlahos through neighbouring properties at Barwon Heads. The Flemington horseman said this was an opportunity too good to pass up and was delighted that, like Black Caviar, the filly would be staying in Victoria's to race. “It's very rare that a horse like this would be offered for auction,” O'Brien said. “Fillies like this generally would be retained by breeders because anyone lucky enough to breed a filly like this would be very loath to sell it. “So it was really a once-in-a-generation chance to buy a filly like this, not only the pedigree but she's an outstanding individual herself. “The mare's still a very young mare, this is only her fourth foal, and she's shown us what an outstanding producer she's been with the three foals that have already raced and arguably this is by the best stallion that she's ever been to. Vlahos won a spirited bidding duel, that kicked off at $1 million – just $25,000 less than All Too Hard fetched at last year's sale – and leapt straight to $1.5 million. Bidding quickly escalated in $100,000 increments to $2.2 million and while those involved then took their time putting their hand up, there were four more bids before Vlahos got to sign off on the filly. “At $2.5 million I got a little bit wobbly but we pretty much stuck to our price and we think she's worth exactly what we paid for her,” Vlahos said. Anyone interested in purchasing a share in the filly is asked to call Danny O'Brien Racing Bloodstock Manager Karl Brown on 0412 717 941.